May 28, 2006, LG Crabo. Euxoa edictalis is our earliest-flying Euxoa and is on the wing with some of the earliest moths in April. It is a medium-sized moth (FW length 15–17 mm) with a uniform hoary olive-tan ground color color and black transverse lines and spots. In some specimens the cell between the spots is dark gray. The basal line is inconspicuous near the base. The antemedial line is slanted slightly toward the outer margin and is toothed strongly toward the base on the veins. The median line is faint and diffuse, often absent. The postmedial line is strongly and evenly toothed. The subterminal line is pale, barely evident near the costa and absent elsewhere. The terminal line is a series of black spots. The fringe is slightly lighter than the terminal area. The orbicular and reniform spot are usually faintly and incompletely outlined by dark gray and filled with the ground color or a slightly lighter shade thereof. The orbicular spot is oval, sometimes nearly touching the reniform spot. The reniform spot is kidney-shaped. The claviform spot is inconspicuous, sometimes absent, narrow. 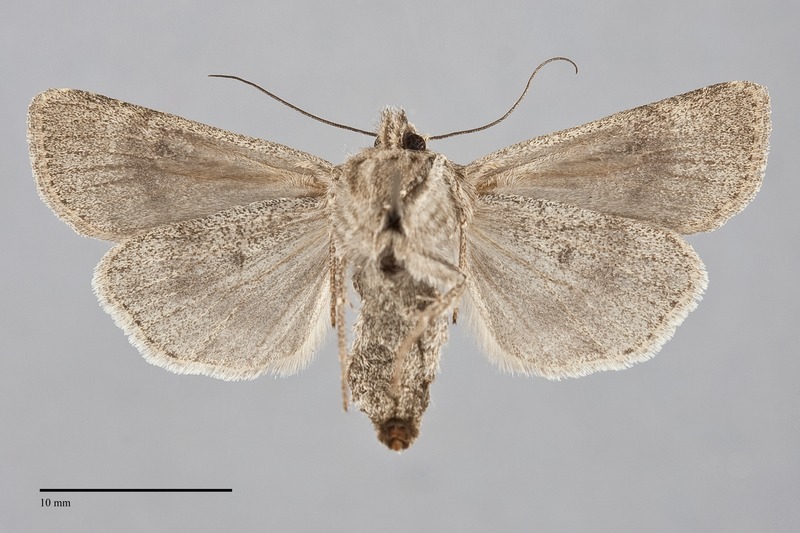 The hindwing is light gray-tan at the base and slightly darker gray elsewhere, with a dark discal spot and a pale whitish fringe. The head and thorax match the wing color. The male antenna is bipectinate and unusually wide for the genus. 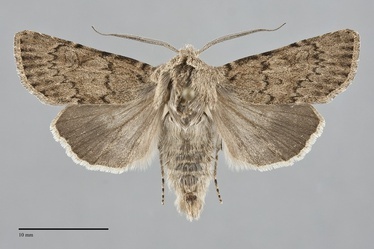 This moth can usually be recognized by its uniform olive-gray color, simple pattern of thin black lines, evenly toothed postmedial line, and - in males - a wide antenna. Anarta fuscolenta flies with it in sage steppe and is similar in size and color. It has a large thick claviform spot unlike that of E. edictalis. In addition it has fine hairs on its eyes like other members of its tribe Hadenini. 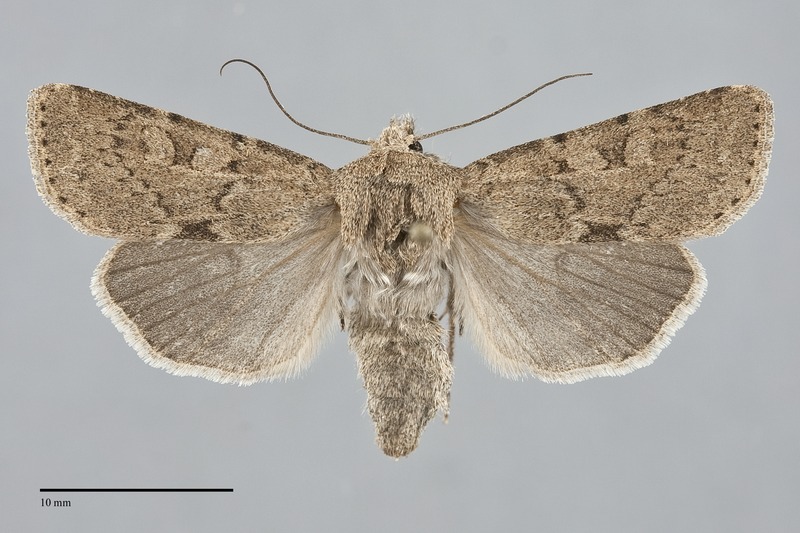 This species is one of three members of the subgenus Longivesica in our region. They are characterized by a very long vesica of the male aedeagus and a long appendix bursae in the female. 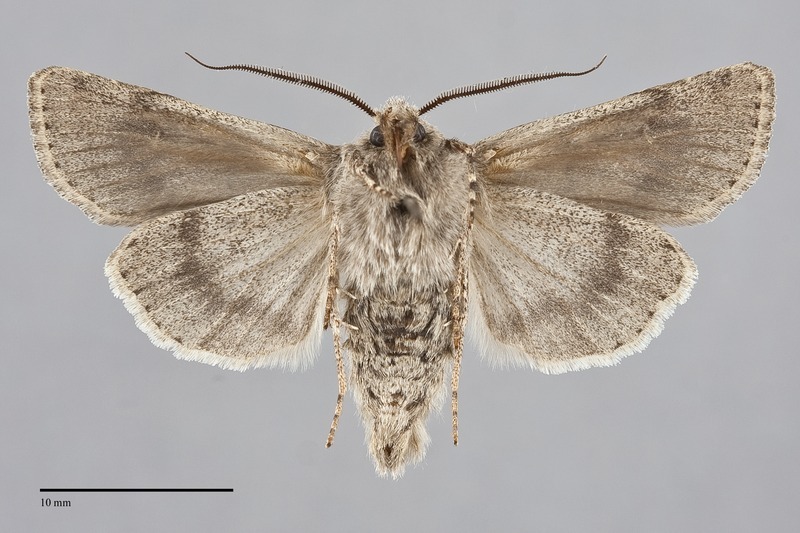 This species is widely distributed in dry forest and rangeland habitats throughout much of western North America, although it has been rarely collected because of the very early adult flight season. In the Pacific Northwest, it is moderately common in juniper woodlands and on dry sagebrush steppe at low to middle elevations east of the Cascades. It also occurs in spruce-fir forests and ponderosa pine forests at higher elevations along the east slope of the Cascades in Oregon, but is usually uncommon to rare in forest habitats. Euxoa edictalis is mostly limited to a narrow band from south-central British Columbia through the western part of the Columbia Basin as far south as the Ochoco Mountains in west-central Oregon. It is also known from southern Idaho. The range of this species extends south through eastern California, including at high elevations in the Sierra Nevada and White Mountains as far south as southern Nevada. Lafontaine (1987) gives isolated additional records from Montana, Utah, and Colorado. Adults fly very early in the year, mostly in April to early May. They are nocturnal and come to lights.